This is the sixth report for my How Do You Jew? project on Jewish identity. 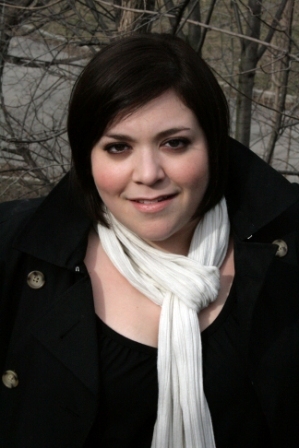 It first appeared as “Sara Kamin: Singer – Songwriter – Psychotherapist” on The Sisterhood blog of The Jewish Daily Forward. Click here to read it there. Singer and songwriter Sara Kamin jokes that she never sleeps. That’s because she’s juggling a burgeoning music career with teaching college-level psychology classes and completing her post-graduate studies in psychotherapy. 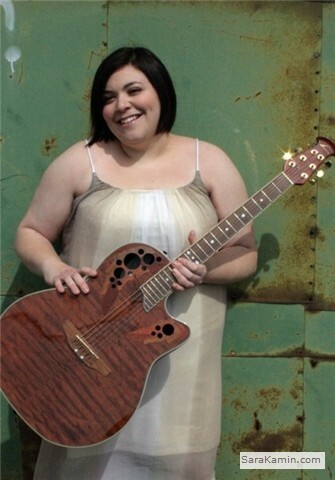 The Toronto-based Kamin, 30. has three folk/pop/blues albums under her belt. And her music has been getting increased attention — and airplay — thanks in part to her new hit single “Superhero.” Kamin, whose summer calendar is packed with gigs in the U.S. and Canada, recently spoke with Sisterhood contributor Renee Ghert-Zand about the balancing act that is her life. Renee Ghert-Zand: How long have you been singing and playing music? Sara Kamin: I’ve been singing since I was 3 or 4, when I would steal my parents’ records and play them in my room. I’d put a pillow under the door so no one would hear me, and I’d sing along to them for hours at night. No one knew I was doing this, and then at 14, I let me mom hear me so she could tell me if I was good enough to sing in a school talent show. She was impressed and immediately set me up with an incredible voice teacher. I learned how to play guitar at 17 from a boy I had a crush on, but I had classical piano and music theory training for quite a few years while I was growing up. I’ve been a professional musician since the age of 20 or 21. How do you manage balancing your music career and your psychology studies and teaching? I’ve always had a life that’s full of a lot of things. I have always really loved psychology, and I am in a unique field that applies elements of sports psychology to the performing arts. I’m, not surprisingly, interested in the talent development and counseling of non-classical musicians. I will do both [music and psychology]. I’m not willing to give either up or let one take precedence over the other. … I don’t know a lot of other performers who are doing what I’m doing. I run every day and do yoga. I take care of myself, and I am happy doing it all. Do you think you’ll manage to keep it all going once you have a psychotherapy practice? My plan is to have a general practice, but to devote some time to working specifically with working artists on a sliding scale. I’ll obviously be based in Toronto, so my plan would be to do less touring and do more in the area of producing music for licensing for television and film use. Tell me about your Jewish background and identity. My being a Jewish woman has always been an important part of my life. Growing up, we went to synagogue and celebrated the holidays, and I still do so with my family. I went to Hebrew school and had a bat mitzvah, but I didn’t continue my Jewish education after that. I also did not get involved in Jewish life on campus at university, because all my extra-curricular time was spent on music. Both [of] my grandmothers are still living — one is 91 and the other is 101! My dad’s mom, in particular, was very involved in the Jewish community in Toronto, so that sense of Jewish pride trickled down to me. … Some of my songs are also implicitly connected to my experiences with being stereotyped, in terms of my sensitivity to and writing about issues of prejudice and inequality. How has it been for you to be a woman in the music industry? And what is the music scene in Toronto like? I do have to sometimes deal with people looking past me, like when I come into a store to buy a guitar. There are those superficial issues, the focus on women’s appearances, but I am very proud now of the woman that I am. It’s an exciting time to be in music in Toronto. There’s a huge scene here with a lot of new venues and festivals that are bringing out a lot of new talent. There are fantastic independent labels, too. I think Toronto has become a hotbed for music now because of the unity and collaboration among musicians here. We have the Internet and social networking to thank for that. It has made it really easy for musicians to find and reach out to one another. I just did a gig last week with the winner of Canadian Idol because we connected via Twitter. I also funded the entire production of my third CD solely through pre-orders through Twitter! What advice do you have for teenage girls and women in their 20s who discover that they have multiple interests and passions? Consult with other people and get input from them, but make choices based on what is right and best for you. Don’t limit yourself. Plant seeds and see what comes up. This is the fifth report for my How Do You Jew? project on Jewish identity. A version of this post appeared on the Sisterhood blog of The Forward. Click here to read it. 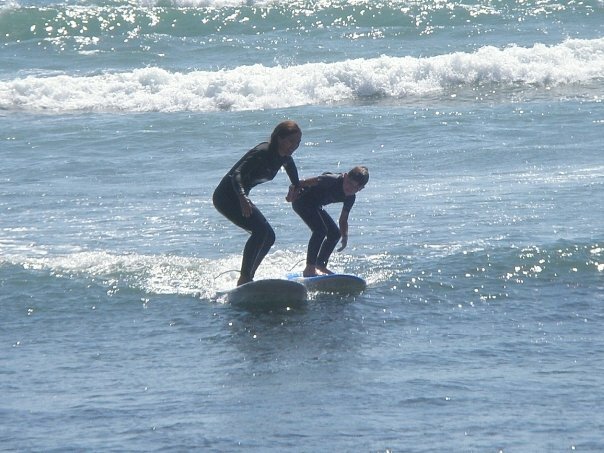 Navah Paskowitz-Walther surfing with one of her sons. Knowing Navah Paskowitz-Walther today as a San Fernando Valley stay-at-home mom active in her synagogue and children’s Jewish day school, it is hard to believe that as a child she lived a peripatetic existence in a 24-ft. camper. 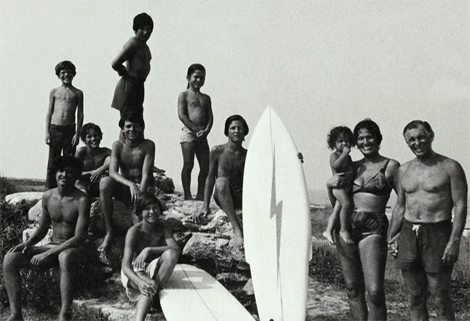 Growing up as the only girl in a Jewish family of nine children, she surfed every day, never went to school, and bowed to her father Dorian “Doc” Paskowitz’s heavy-handed and idiosyncratic approach to parenting. Her story sounds like something in a movie, which it actually has been and will be. The highly unconventional Paskowitzes, the largest and best known family in surfing, are the subject of the 2007 documentary, Surfwise, and a feature film about them is currently in pre-production. While the focus of these films is on all the Paskowitzes, Navah’s story deserves special attention – not only because she is the sole daughter, but also because of the particularly Jewish role she has played and continues to play in the family. Despite the preponderance of males in the Paskowitz household and her father’s partriarchic chauvinism, it is Navah who has taken the responsibility for passing Judaism on to the next generation most to heart. While Navah, like all her siblings, has intermarried, she is the only one raising her children exclusively in the Jewish faith. Even more so, she, with the full support and participation of her husband of German-Quaker background (whom Doc ironically and affectionately refers to as “the most Jewish son I have”), is making sure that her daughter and three sons receive the serious Jewish education she never had. The Paskowitz family in the mid-1970's. Navah is in the center, second to the left of the surfboard. Under the direction of her father and with the compliance of her mother (a convert to Judaism of Mexican Indian descent), Navah and her siblings practiced their “own version of Judaism,” as she describes it. Her father insisted that they observe holidays and the laws of kashrut. The family’s weekly kabbalat Shabbat celebration and festive meal was a highly anticipated change from the usually austere fare on which they otherwise subsisted. However, the Paskowitzes never did any of this within a community beyond themselves. Moving from place to place at a moment’s notice, Navah and her brothers never had a regular set of friends or stable social environment, let alone a Jewish peer group. In fact, she recalls being surrounded by born again Christians in Orange County, where the family spent a lot of time. As a result, Navah has worked hard as a mother, making personal and economic sacrifices, to ensure that her own children accumulate a high level of Jewish social capital. Navah Paskowitz in her modeling days. On her own from the age of 15 and without any formal education, Navah supported herself by singing in a band with her brother Adam (now the lead singer of The Flys and Jetliner), modeling swimsuits, designing a women’s wetsuit line, and working summers at her family’s surf camp on a beach near San Clemente, CA. But the job that Navah, now 40, has had the longest and which she considers to be the most important, is that of Jewish mother. It involves “forcing the kids to do the traditional stuff” and making sure they learn Hebrew, which Navah herself failed to master despite living in Israel at one point for a year and half and studying in an ulpan. “I was hopeless from the get-go,” she pokes fun at herself. Without any immediate and concrete Jewish connections, it was the more historical and abstract notions that played a role in Navah’s own upbringing. The Holocaust figures prominently in her sense of Jewish identity and in the one she wants to impart to her children. She recalls her father putting on tefillin every morning and, while not exactly reciting the traditional Shacharit prayers, speaking to the victims of the Holocaust. “Our exposure to Judaism was very similar to that of the children of Holocaust survivors. My dad was so affected by the horror of the Holocaust, that it was a daily reminder in our home.” Dorian Paskowitz’s bid to repopulate the world with Jews was self-evident. There was never any question as to why he fathered so many children, gave them all biblical names, and insisted on raising them as Jews, notwithstanding his otherwise untraditional ways. 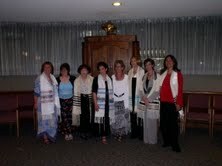 Navah (on the far right) became an adult bat mitzvah while pregnant with her third child in 2003. Israel, too, has been very important to Navah. In fact, it was when she visited Yad Vashem during a six-month stay in Israel with her parents and her younger brother when she was 14 that she realized that “it was my life’s mission – to live a Jewish life. To remember those lost. To live for them, really.” Beyond the connection to the Holocaust, she wants her children to hold Israel dear. “I want them to feel they have a homeland that’s theirs as Jews, and for them to love and support Israel going forward. We are extremely lucky to have found a Jewish day school that promotes and fosters love of Israel as a basic part of the curriculum and has many Israeli teachers and students,” she says. As someone who personally experienced anti-Semitism while growing up, “I always vowed that my children would be surrounded by ‘their’ people…and feel proud of being Jews.” Not surprisingly, Navah is planning to hold her daughter’s bat mitzvah in Israel next year. “A chaotic lifestyle leads to a chaotic mind,” Navah frankly admits. She has endured personal struggles as an adult, and it has been a long journey for her toward reconciliation with her parents – her father, in particular. It has been Judaism that has played a key role in her ultimately making peace with her past and mending familial relationships. Navah relishes being “The Jew” of the Paskowitz family, the one to whose home everyone comes for Passover and Hanukkah. 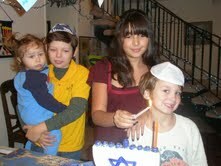 Navah's children lighting the Hanukkah candles. Navah freely admits to having resentments about her childhood, but she says she would “never in the world change the experiences” that she and her brothers had together. But not wishing to change the past is not the same as wanting it to be your present or future. Navah still surfs (though not as regularly as she would like) and has taught her children to, as well. It is thanks to what their grandfather taught their mother that the kids can stand on their boards, but they are going to ride a different wave. Update: The version of this article appearing in the Sisterhood blog of The Forward was cross-posted on Jewesses With Attitude, the Jewish Women’s Archive blog. Click here to read it.